Dunnedin Ventures Inc. (TSXV:DVI) (the “Company” or “Dunnedin”) provides an update on the diamond exploration progress at its 100% owned Kahuna Diamond Project in Nunavut, Canada (“Kahuna”), and outlines its strategic plans for both its diamond and copper-gold assets. While Dunnedin is fully committed to the diamond potential at the Kahuna Project, the Company believes current market conditions are favourable for discovery-stage porphyry copper-gold projects, and will now begin to unlock the value of its 100% owned Trapper Project to the benefit of shareholders. Dunnedin is considering strategies to advance this project and realise its value, including active exploration during the 2019 field season and various transaction alternatives such as a spin-out, combination with other copper assets, farm-in/joint venture and sale. A technical review of all drilling, geophysical and geochemical data is now underway to inform management. Decisions are expected to be announced over the coming days. The Company is pleased to announce the appointment of Steven Krause, CPA, CA, ICD.D as director and chair of the audit committee. Mr. Krause is the co-founder, president and a director of Avisar Chartered Professional Accountants. He has worked extensively with mining, mineral exploration and development stage companies in North and South America. Mr. Krause is also the former chairman of Luna Gold, where he was chairman until the successful merger of Luna Gold and JDL Gold to form Trek Mining, in a $360 million merger. He is currently the CFO of Viva Gold Corp. and the former CFO of Bear Creek Mining Corporation. Mr. Krause holds a Bachelor of Business Administration degree from Trinity Western University and received his Chartered Professional Accountant designation in 1997. He also holds a Certified Public Accountant designation in the state of Illinois, USA and is a graduate of the Institute of Corporate Director’s Education Program (ICD). Dunnedin Ventures Inc. (TSXV: DVI) is focused on its 100% owned, advanced-stage Kahuna Diamond Project in Nunavut which hosts a high-grade, near surface inferred diamond resource and numerous kimberlite pipe targets. The Company holds diamond interests in 1,664 km2 of mineral tenure located 26 kilometres northeast of Rankin Inlet and adjacent to Agnico Eagle’s Meliadine gold mine. The Kahuna Diamond Project has an Inferred Resource Estimate of 3,987,000 tonnes at an average grade of 1.01 carats per tonne, totalling over 4 million carats of diamonds (+0.85 mm) (see news release dated March 31, 2015). Dunnedin’s drilling is aimed at the discovery of diamondiferous kimberlite pipes, and the Company is working with advisor and largest shareholder Dr. Chuck Fipke to define and prioritize drill targets based on an extensive historic data set, and diamonds and indicator minerals recovered from a series of kimberlite and till samples over four seasons of field work. 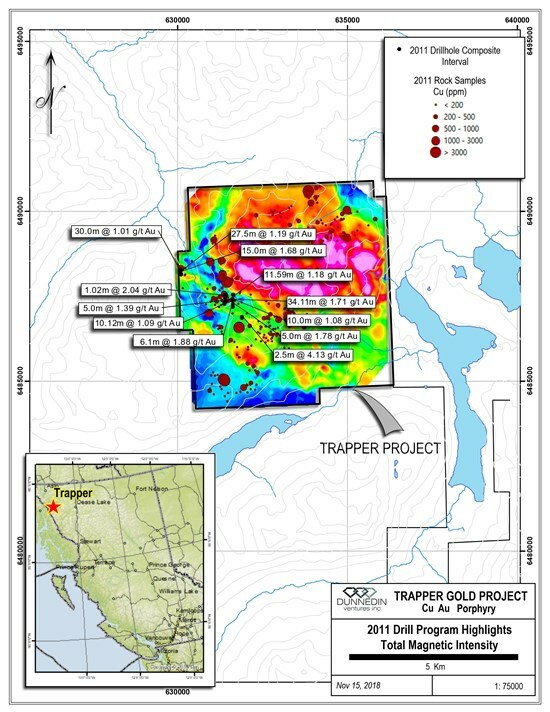 Dunnedin also holds a 100% interest in the Trapper Porphyry Project near Atlin in the northern “Golden Triangle” region of British Columbia. The Trapper Project is interpreted to overlie a gold-rich copper porphyry complex having a surface geochemical, geophysical and regional alteration signature of over 15 square kilometres. Based in Vancouver, Dunnedin is backed by a world-renowned team of exploration experts with decades of combined exploration experience and significant capital market strength. Click here to connect with Dunnedin Ventures Inc. (TSXV:DVI) for an Investor Presentation.